This recipe uses basic pantry and refrigerator items that you most likely have in stock which means you can make it at a moments notice. This recipe makes a huge batch that fills my 8 quart Instant Pot pressure cooker. If you don’t have the 8 quart cut the recipe in half and make it in your 6 quart. As you all know I love to batch cook and make good use of my time in the kitchen so I like to make enough to freeze some for future meals. It doesn’t take much longer to make a big batch of anything and then I only have to mess up my kitchen one time and do dishes once but we enjoy multiple meals for that one effort. We use the Rubbermaid Food Storage containers – the work well in the fridge or freezer. The dissolvable labels are amazing – we date everything and write the name of the recipe on them. We always have a wide variety of homemade frozen items to choose from when life is too busy to cook. The flavor of this stew is beyond ordinary – I use Herbs de Provence which is a lovely blend of thyme, marjoram, savory, rosemary,basil, sage and lavender. It’s available in most spice sections at the grocery store. I bought a big jar of it at Trader Joe’s last winter and at one time Costco had it too but I haven’t seen it lately at either store. If you can’t find it in your local grocery you can make a jar of your own by using 2 tablespoons of each spice listed and give them a stir to combine – Thyme, Marjoram, Savor, Rosemary, Basil, Sage and Lavender. You could sub an Italian Seasoning Mix for the Herbs de Provence and the flavor profile would be similar – not exact but similar and still quite good. 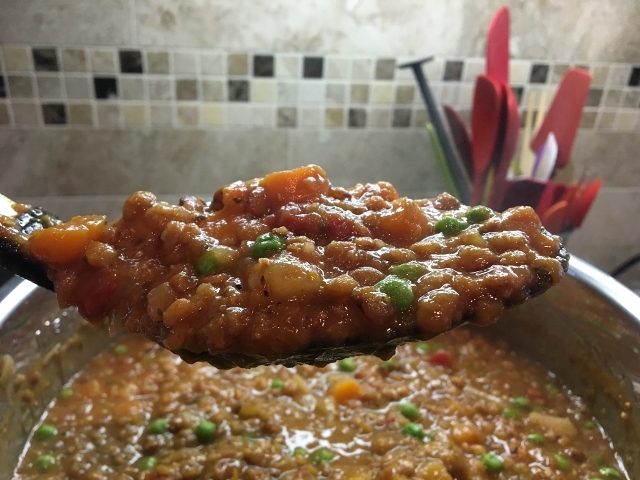 Hearty Lentil Vegetable Stew ingredients – not shown the vegetables. 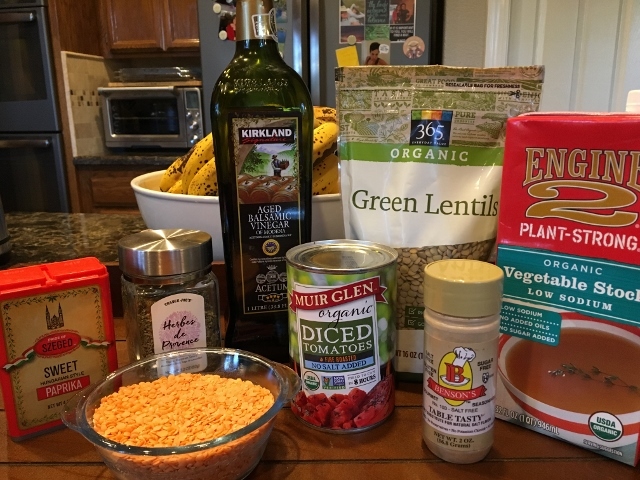 Here is a look at the ingredients used in the recipe – not shown are the vegetables – you all know what those look like! 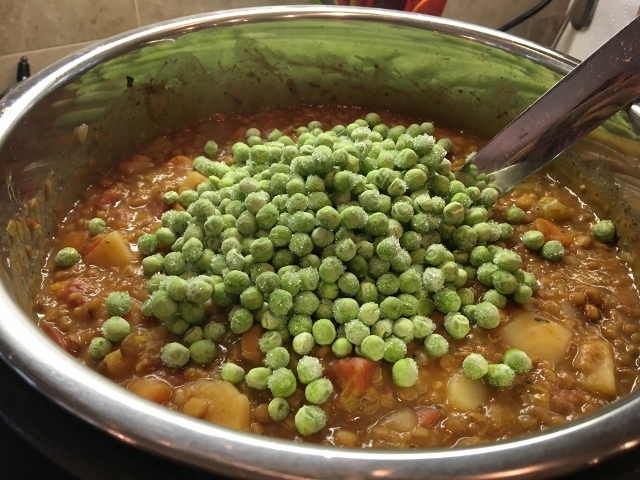 Frozen peas are a nice addition to this stew – add them after it cooks and comes down from pressure. If you don’t like peas – I know there are a lot of anti-pea people out there – sub some cut green beans or frozen corn instead they will add a nice color and taste good too. Remember that recipes are just ideas – you can sub ingredients that you have on hand and that you prefer. This is a thick, hearty, stick to your ribs kind of stew. After setting in the fridge over night it will become thicker. You might want to add a little more low sodium vegetable broth to thin it a bit. You can dice the vegetables or leave them in bigger pieces – it’s personal preference. Those red Tovolo Flex Silicone Spatulas in the background are my favorite kitchen tool – I use them everyday! 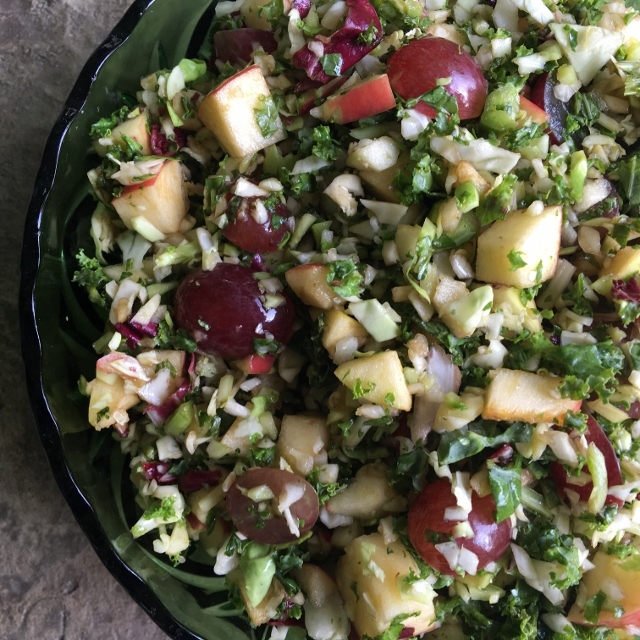 Autumn Slaw with apples and grapes. I served this stew with a fresh crunchy slaw made with grapes and apples and chopped in my Holland Bowl Mill wood bowl. Recipe coming soon! This may sound a little crazy but let me tell you this makes a delicious topping for a Big Beautiful Chopped Salad. 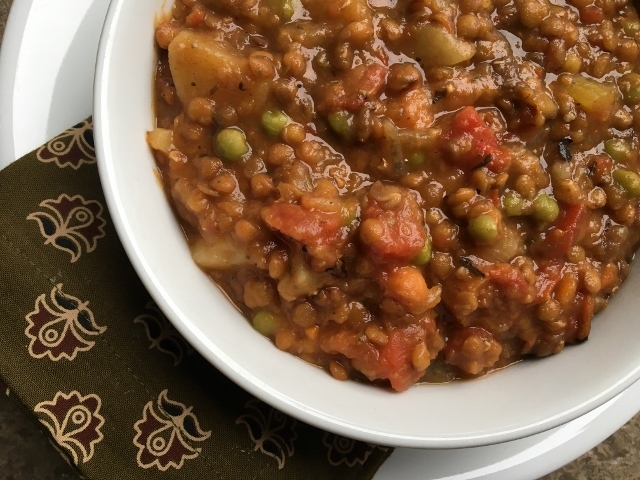 I warmed up a small serving of the Hearty Lentil Vegetable Stew and poured it over my chopped salad that I had tossed with some Napa Valley Naturals Grand Reserve Balsamic Vinegar. It was so good I had this for lunch three days in a row. Set the 8 qt Instant Pot pressure cooker to saute – when hot add the onions, carrots and celery and a couple tablespoons of the low sodium vegetable broth. Saute just until vegetables are no longer raw – 3-4 mintues – they are going to cook when under pressure so we are just giving them a little head start. Add the potatoes, green lentils, red lentils, vegetable broth, water, fire roasted tomatoes, Herbs de Provence, Table Tasty, freshly ground black pepper and sweet paprika to the pot. Put the lid on and make sure the venting valve is turned to sealing. Set the time to 6 minutes high pressure. Let the pressure come down naturally, then open the lid carefully tipping the lid away from you. Add the frozen peas, balsamic vinegar and a little additonal Herbs de Provence to boost the flavor. I always taste it and then decide how much to add. Put the lid back on and let the peas get good and hot. * The flavor of this stew is beyond ordinary – I use Herbs de Provence which is a lovely blend of thyme, marjoram, savory, rosemary, basil, sage and lavender. It’s available in most spice sections at the grocery store. I bought a big jar of it at Trader Joe’s last winter and at one time Costco had it too but I haven’t seen it lately at either store. If you can’t find it in your local grocery you can make a jar of your own by using 2 tablespoons of each spice listed and give them a stir to combine – Thyme, Marjoram, Savor, Rosemary, Basil, Sage and Lavender. 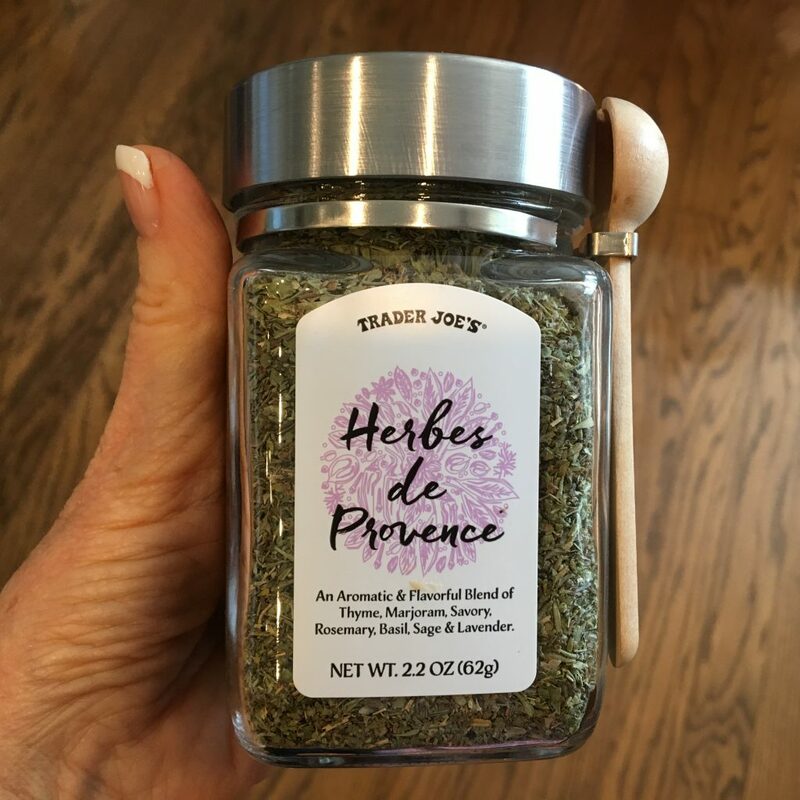 You could sub an Italian Seasoning Mix for the Herbs de Provence and the flavor profile would be similar – not exact but similar and quite good. ** Edited to add this because several people asked how to make this without an Instant Pot. For a Slow Cooker I would saute the onions, carrots and celery then add to a slow cooker. I would try cooking it in the slow cooker for 4-5 hours on high or 8 hours on low. On the stove top I would saute the onions, carrots and celery, then add the other ingredients bring it to a boil, turn the burner down to a simmer and simmer for about 30-45 minutes or until the lentils, potatoes and carrots are cooked. I haven’t made it this way so this is just an educated guess! Serving suggestion: Ladle into bowls and enjoy with this Sweet Apple Kale Slaw in a bowl on the side. After sitting in the fridge overnight the stew does get even thicker so you may want to add a little broth to thin it out when you heat it up. It will also freeze well. We have babies in the house! We are so busy right now with our twin grandchildren and our 2 1/2 year old granddaughter who is now a big sister to a little brother and little sister. They are staying with us right now as momma recovers and we all ajdust to caring for little preemies. It is a joy filled time for us all to finally have the babies in our arms. Big sister is loving her siblings and adjusting to sharing our attention. We feel truly blessed. Batch cooking and batch salad prep is what is keeping us going! Never before has it been so important to have food prepped and ready to heat and eat. We call it our homemade “fast food.” We are on “baby” time around here – our meals get squeezed in around feedings, diaper changes and an active 2 1/2 year old! Sometimes we can all sit down together and eat and other times it happens in shifts. We have very little time to sit down. Hubby Tom and I are grateful to be so healthy and have the energy to keep up with a very busy lifestyle. Thank goodness for a whole food plant based diet! Get Healthy and Stay Healthy One Meal At A Time! When you purchase items using our affiliate links you help support our work here on the blog and our Nutmeg Notebook You Tube Channel. Thank you for your support! Please check out our Amazon Recommendation Page to see lots of our favorite gadgets. Previous Post: « Taco Salad Anyone? Congratulations to you and your lovely family! Sending good wishes as Momma recovers and a Grandparents snuggle to the beautiful babies and big sister! 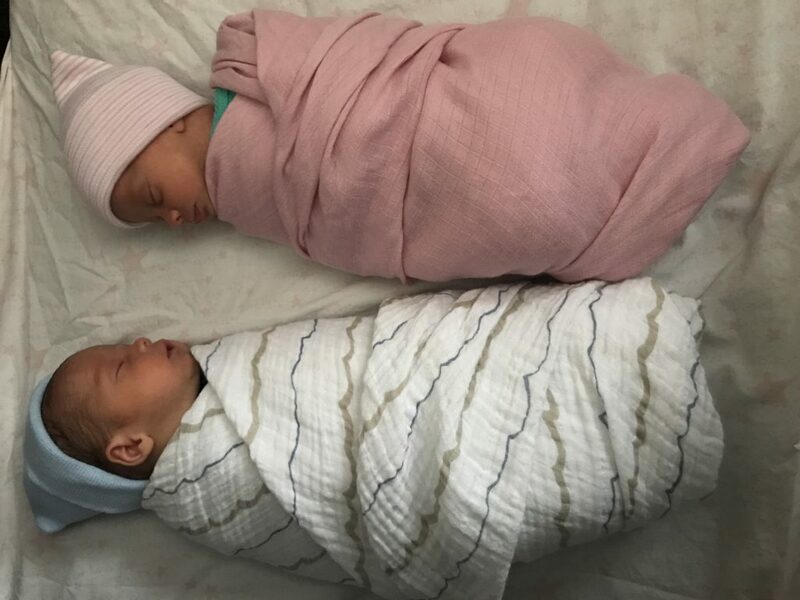 Thank you so much Marion – what a blessing these two little babies are! I don’t have a pressure cooker. How would you adapt for either on top of stove or slow cooker? Thanks! Looks delicious! I would try cooking it in the slow cooker for 4-5 hours on high or 8 hours on low. I haven’t tried this myself so it is just an educated guess. On the stove top I would saute the onions, carrots and celery, then add the other ingredients bring it to a boil, turn the burner down to a simmer and simmer for about 30-45 minutes or until the lentils, potatoes and carrots are cooked. I haven’t made it this way so this is just an educated guess! Enjoy and happy healthy cooking! Thanks for sharing these recipes, Tami. I love a good lentil stew! And congratulations on the grandbabies! Congratulations on your precious grand cherubs!! They are beautiful!! As a mom of boy/girl twins who are now 19 years old, I can totally relate. Mine were premies too 🙂 I was grateful for my parents and their help!! Enjoy every minute they grow up so fast! Thank you for this amazing recipe, I can’t wait to try it! Thank you for sharing your personal story Traci. I don’t know how anyone takes care of twins and toddler without help! I hope you enjoy the recipe. Happy Healthy Cooking! Oh dear! I don’t have a hot pot. How might I make this in my slow-cooker? Thank You! The Babie are Adorable! I woult try this in the slow cooker on high for 4-5 hours or on low for 8 hours. I haven’t tried it in the slow cooker so this is just an educated guess. Happy Healthy Cooking! Oh Tami….they are the sweetest, Congratulations! I’ m going to make your “Twins Lentil Stew” for my family soon. 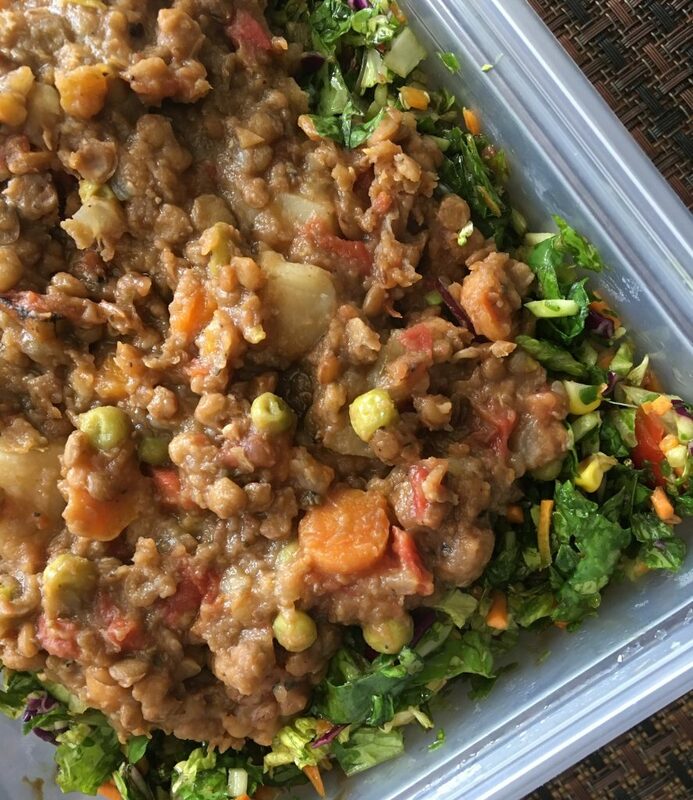 Thank you Pam – enjoy the “Twins Lentil Stew!” Happy healthy cooking! Congratulations on those precious angels! Thanks for the stew! Thank you Betty! I hope you try the stew and enjoy it as much as we do. 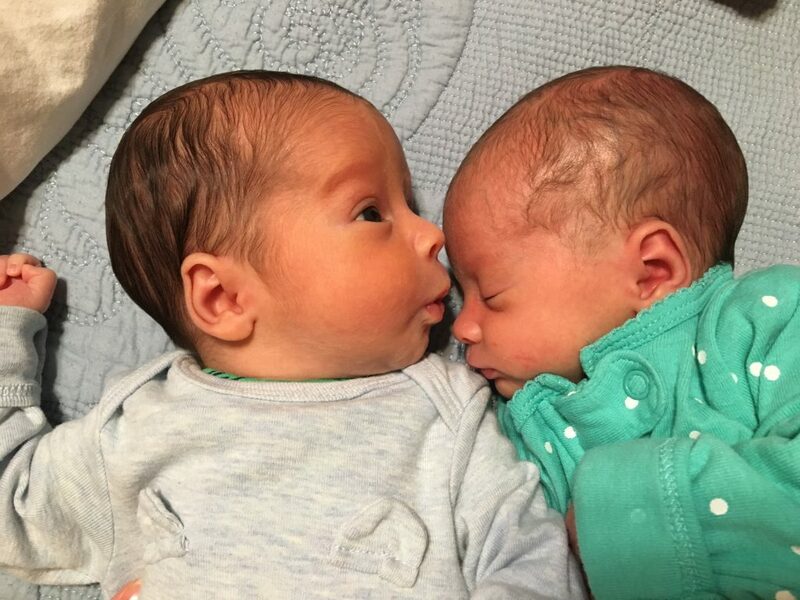 The twins are adorable, Tami! How lucky you all are. I’m so happy for you. I hope Katy has been able to finally get some good rest, and that she’s starting to feel better and stronger. Enjoy those little ones! Thanks for the recipe too! I am really loving lentils, and would like to try this for a change. I’ll have to pick up some sweet paprika, as I always used smoked. This’ll be interesting! She is starting to feel better but tired of course from all those night time feedings x 2! I love lentils too – they are so hearty and filling and I love the texture. Katy doesn’t like smoked paprika so I used sweet which I think is a better pairing with this stew. I must have been lucky enough to have caught this on Pinterest yesterday, after you posted it! I just made this, mainly based on the picture of a nice thick lentil stew. I’m a WF vegan anyway, so this is up my alley. It tastes great, and I did cut everything in half for my 6qt IP. Thank you, and I’ll be sharing! That’s great Jessica! Thank you so much for the feedback – I am delighted to know you liked it and will share be sharing the recipe! This stew is delicious! I halved the recipe for my 6 quart Instant Pot and it worked great! I gave some to a friend who does not eat a WFPBNO diet, and both she and her husband liked it! They commented that it is very filling and they didn’t miss having meat. Thanks Tami for this recipe! Thank you so much for that review! Bless you for sharing with your friends – if the food wasn’t good we wouldn’t stick with this lifestyle! I saw your post on FB and decided it looked too good to not try it. But since I had some eggplant and sweet Italian peppers I put those in instead of the potatoes. It turned out great! I had about 8 cups to divide up for the fridge and freezer and am freeze drying the rest for future travels. Your changes sound wonderful! What a great idea to freeze dry some for traveling. I am glad you like the recipes I share and appreciate you taking the time to let me know. Getting feedback like this keeps me motivated to work on the blog! This sounds delicious. Thanks for sharing it – and congrats on those two beautiful grand-babies. I am so delighted that you like the stew – my family loves it.I really should name it Twins Lentil Stew! The two types of lentils does make it even yummier! How fun that you are going to take it to share with your close knit family. I am sure our families story of twins will inspire all kinds of memories and stories for your family. I am truly inspired by you and all you do with your grands not to mention how you have transformed yourself this past year and changed your life. You are amazing! I will send you a facebook message to tell you how to make the coleslaw! Super simple but we really liked it. These days I really like simple. This recipe was amazing! Even my 9 year old son who we are working on transitioning to a plant based diet ate 2 servings. Thank you for posting this on top of your busy schedule with your family and newborn grandbabies. Congrats and Lots of Love to you! Thank you BJ – I am so delighted that your son liked this stew! Thank you for your support. 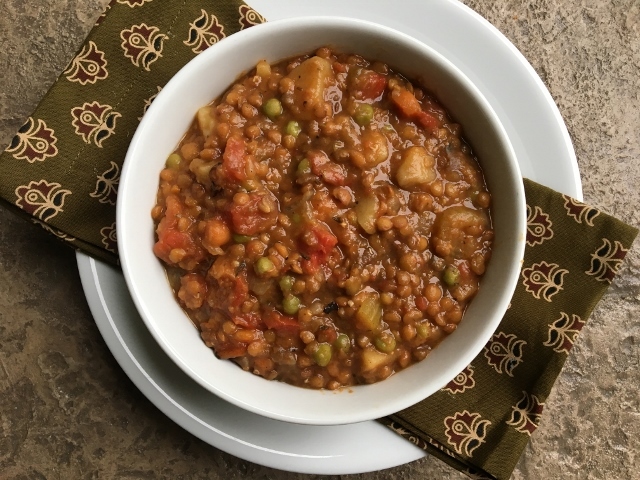 This Lentil Stew is delicious Tami! I have a busy week ahead and I will be looking forward to coming home to a big bowl of deliciousness! Congratulations on your growing family – more for you to love! Thank you so much Molly. I am so glad that so many people are enjoying this recipe! Do you think half the recipe would work in a 3 qt IP? The full recipe fills my 8 qt Instant pot so half the recipe would be about 4 quarts. You could cut the recipe in thirds and then it will fit in your 3 qt IP. Hope that helps. I made this today, and you’re right, it fills the Instant Pot slightly above the max fill line. It took 4-1/2 hours from start to finish by the time I chopped all of vegetables, and waiting for pressure to come up and go down. This makes a ton of stew, so even if you have an 8 quart, I recommend halving the recipe. After all that time and effort, I was a little disappointed with the taste, and I would rate this 4 out of 5 stars. Hi Mark, I am sorry that you were disappointed with this recipe as it has been so popular with my readers. We all enjoy different flavor profiles and prefer some tastes over others. Thank you for your feedback.